Another price reduction 6/1/18 to $239,000ANDthe owner is willing to consider selling on a personal contract. This is huge, as traditional marine lenders will typically not finance older, classic boats. Preserve your cash to apply to changes you’d like to make to the boat, the first year of moorage, etc. Your offer incorporating an owner contract will be seriously considered. This classic yacht in very nice condition MUST BE SOLD SOON. Owner’s personal situation compels him to SELL NOW, even if at a great loss. Well over $1M invested by this owner in a major refit, all of which he’s now willing to give away. USCG documented vessel with no restrictions, so a US buyer could set up this yacht as a small business, if desired: Local day charter & dinner cruise operation? She’d be lovely for that. Boutique Alaska nature cruise operation? She’d be a winner! Or just your Inside Passage cruiser and extremely comfortable liveaboard - in a classic yacht that will turn heads in any harbor. Inquire NOW - a beautiful new boating season in the great Northwest is just ahead of us. 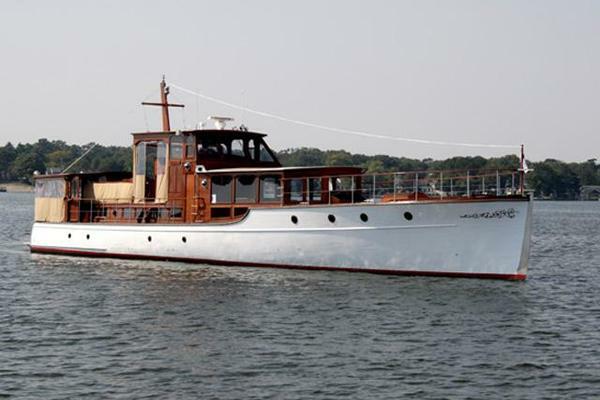 WANIGAN III – an American classic, custom built by the Henry C. Grebe & Co. in Chicago, IL in 1949 for Alice M. O’Brien of St. Paul, MN. Alice was a notable in her time, as a businesswoman, civic leader, philanthropist, humanitarian, adventurer, artist and art collector. She was a skilled driver and mechanic, and served in this capacity in France during WW I, as well as an auxiliary nurse at the front. After launching in the Great Lakes, WANIGAN III was based at and cruised from a family home at Captiva Island, FL. WANIGAN III found her way to the Pacific Northwest in 1958, with new owner George Gaudin of Newport Beach, CA, founder of the Gaudin Motor Company, the first and preeminent Ford dealership of the West Coast. In 1962 the boat passed on to a series of owners, until purchased by Dennis Washington in late 1981 here in the Northwest. A self-made billionaire from AK mining, construction and freight transportation – WANIGAN III was his first in a series of notable, classic boats. Robert Lee then purchased and owned the boat from late 1982 to late 2002, and for many years she was a prominent part of Seattle Seafair events. Eventually, WANIGAN III was donated to the California Maritime Academy Foundation, and subsequently purchased by the current owner in early 2005. For almost three years, summer of 2008 to spring of 2011, the current owner had WANIGAN III on the hard at Haven Boatworks in Port Townsend for an extensive refit, spending over $1M for repair and improvement to the hull planking and frames, tanks, deck, superstructure and interior. With original construction starting in 1949 and launching in the early 1950’s, this boat was conceived, designed and built as a heavy-timber, ocean-going vessel, for extended voyages in waters from Nova Scotia to the West Indies. She has proven herself, and was cruised for many years from Puget Sound to Alaska. With all of the re-fit work in recent years, WANIGAN III is in great shape, and ready to resume voyaging in the Salish Sea and Inside Passage. Older systems have been serviced and kept functional, and the interior has been nicely updated over the years, and invites full-time living aboard, major socializing afloat, and she could readily be put into service as a 6-pack charter vessel for day and dinner cruises, or even for family wildlife charters in SE Alaska. 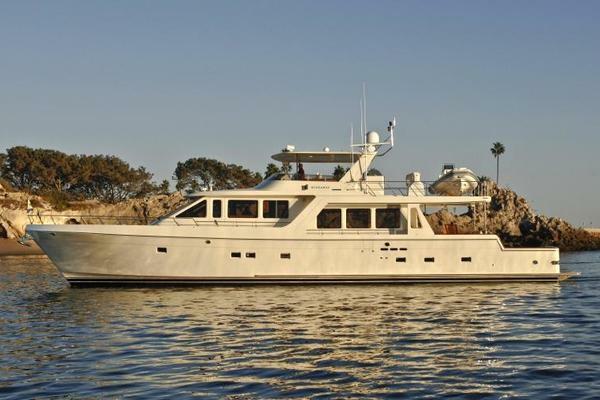 Located at Elliott Bay Marina in Seattle, WA – please inquire to arrange a viewing of this elegant, classic, pilothouse motor yacht. United Yacht Sales New Jersey would love to guide you through a personal showing of this 76' Grebe 76 1949. This yacht for sale is located in Seattle, Washington and priced at $239,000. For a showing please contact us by filling out the form on this page and we will get back to you shortly! Forwardmost is the chain locker w/ access from the focs’l cabin. The windlass motor is easily accessed at the overhead of the focs’l cabin. The focs’l cabin was designed w/ single berths port & starboard. Currently, part of the port berth space has been modified to accommodate a stacked washer & dryer set – this could be changed back. There are drawers, shelves & hanging lockers under port & starboard. The focs’l cabin has two bronze opening ports, one to either side. Updated fluorescent fixture; baseboard heating w/ thermostat. Single berth outboard w/ storage under; full-height hanging locker. The forward cabin has one bronze opening port in the hull-side. Ladder to the focs’l hatch in the hallway. VacuFlush toilet; vanity sink & stall shower; lockers above & below. Powered vent; baseboard heating w/ thermostat; one opening port. Updated compacter & induction-top stove/oven forward. Large, stainless steel double-sink & large counters to port. Extensive storage cabinets on entire starboard side. Updated dual fridge/freezer units side-by-side at aft bulkhead. Stair access to the salon & engine room access also at aft bulkhead. Updated flush lighting fixtures, outlets, etc. Island table w/ three stools; drawer stack & updated dishwasher under. Baseboard heating w/ thermostat; six bronze opening ports. Up from the galley on the main level w/ access to starboard sidedeck, wheelhouse & aft salon. Free-standing, decorative LPG fireplace at the forward bulkhead. Six large dead-lights – three to either side; updated lighting fixtures. Large storage cabinets aft to port & starboard. Solid walnut dining table w/ six matching chairs – will seat eight comfortably as is, or up to twelve if end extensions installed. Note: Dining table end extensions could only be used if the table was moved to the aft salon area – the boat has been configured this way in the past. Aft starboard corner – stairs down to aft quarters. Two, large single over & under berths w/ two drawer stacks & full-height hanging locker. Baseboard heating w/ thermostat; two bronze opening ports. Single berth outboard w/ drawers & storage under. Baseboard heating; two bronze opening ports. VacuFlush toilet; vanity sink & stall shower; storage above & below. Powered vent; baseboard heating w/ thermostat. Updated, recessed lighting; two bronze opening ports. VacuFlush toilet; vanity sink set in a large countertop; large stall shower. Lots of storage lockers above and below. Updated, recessed lighting; one bronze opening port. Full-width cabin w/ centerline, queen-size walk-around berth. Very large, cedar-lined hanging locker to port. Extensive drawers & cabinets to starboard, plus a comfortable built-in settee. Built-in space heaters; multiple lighting schemes; six bronze opening ports. Pilot house configuration separate from the living areas of the boat. Doors port & starboard to the side-decks, w/ access to the salon aft. Excellent visibility forward over the bow & to both sides. Aft is a very comfortable settee that will seat three. Chart table to port w/ chart drawers & extensive storage side to side & under the helm console. Originally an open aft deck, this area has been fully enclosed. Forward to port & starboard are doors to the side-decks. To either side of the doorway to the amidships salon are upper & lower cabinets w/ considerable storage capacity & including two under-counter cooling units. Aftmost is currently an area dedicated to exercise equipment & nominally separated from the salon proper w/ roll-down bamboo screens. Large windows surround this area both sides & across the stern. To port is a ladder up to a hatch for access to the sun & boat deck. Currently this area has lounging furniture & a large flat-screen TV, but in recent times past, the contents of this area have been swapped w/ the current dining room furniture. Updated lighting fixtures; carpet over original teak decking; entertainment system; misc. furniture. Accessed from a ladder in the aft salon. Extended sun & boat deck from the wheel house to the stern. Tender stores amidships w/ launching davits either side. Railing enclosure from the davits aft & around the stern. Large fiberglass storage boxes also serve as sun deck seating.